In February 1904, the Great Fire of Baltimore raged for two days, burning much of downtown. It was a devastating disaster that helped prompt standardization and reform in the firefighting industry. 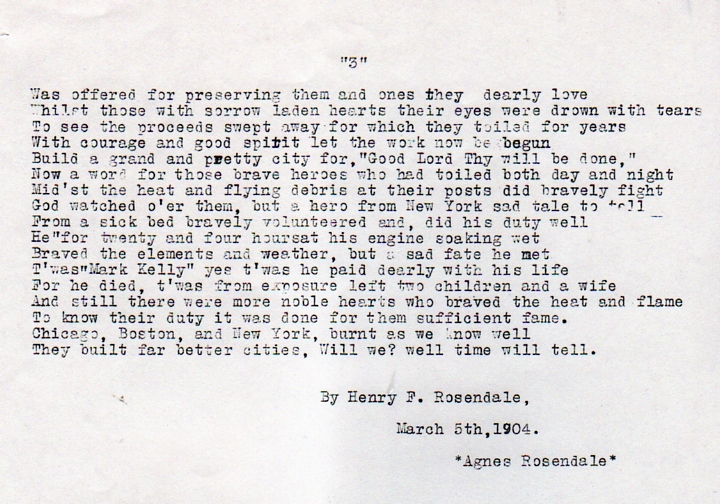 A month later, my great-great-great-uncle Henry F. Rosendale wrote a narrative poem, detailing the events of the fire that ravaged the city. The poem is hardly personal: instead it is highly detailed, almost encyclopedic, relating many facts that one now finds in modern encyclopedia articles. 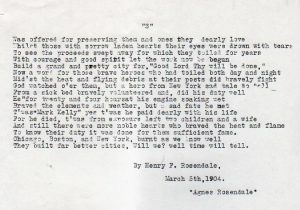 Henry relates the progression of the fire, the direction of the winds that carried it, the help that came from other cities (“From Washington and from New York in record breaking time”), and the dynamiting of buildings meant to act as a fire break. What inspired a man who worked in the furniture business to turn to this literary endeavor? What can this poem reveal about Henry himself, and more broadly, the experience of living through this disaster? The 1900 census reports that four years before the fire, at age 27, Henry still lived with his father and mother and five out of his ten surviving siblings. The family furniture business was sold one year before, in 1899, but Henry and his father Christopher still worked in furniture manufacturing. My direct ancestor, his younger brother, Aloysius or “Ollie,” lived with his wife and her family and their first child. Ollie Rosendale worked in insurance. In a comparison of maps, it looked like neither Henry nor Ollie lived in the future “Burnt District” in 1900. By 1904, the Baltimore city directory for that year shows many Rosendales including Henry and Christopher working at 1321 N. Eden Street, which seems to have been north of the sweep of the fire. Henry concluded his poem with a comparison of Baltimore’s fire with other major city’s disasters: “Chicago, Boston, and New York, burnt as we know well,/They built far better cities, will we? well time will tell.” A 1906 headline in the Baltimore Sun read “Two Years After Fire Baltimore is Booming.” The 1910 census seems to suggest that for Henry, life was positive. He had gotten married to Margaret O’Brien and lived with her and their first child at 9 Baltimore Street in an apartment building that had been within the swath of the fire. By 1920, he had many children and a house. Unlike many Baltimoreans, Henry did not lose his home or his business to the fire. Yet he was sufficiently affected by the disaster to turn to verse. There are a few modern resources that are very helpful for learning of others’ experience of Baltimore’s fire. Digital Maryland has a collection of photographs and publications detailing reactions to the disaster. They have an interactive map showing the progression of the flames. When I set off to learn about the Great Baltimore Fire, I knew nothing about the bitter cold, the firefighting gear that didn’t work, and other perils faced by the firemen and citizens of Baltimore. 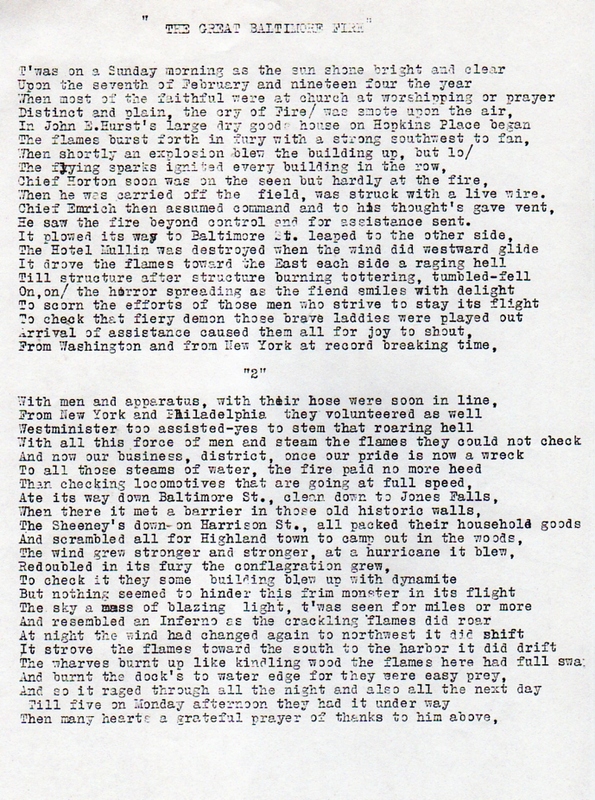 Henry’s poem and Digital Maryland’s resources provide a glimpse into life in the era of large city fires at the turn of the twentieth century. See also A question of attribution by Scott C. Steward, which includes a 1904 photo of the ruins of Baltimore’s Marine Bank. Thanks for the story. I think such a devastating fire motivates people to record the events and their feelings about it. Another great fire was in May 1811 in Newburyport, Massachusetts. 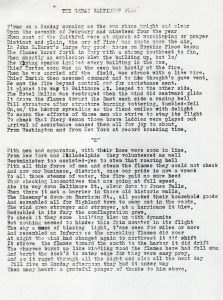 There is a written account that I think includes a poem. Also described was where the fire went and whose property was affected – and how people living in other places offered assistance. My 3x great-grandfather lived through this event and within a few years moved his family to the Philadelphia area. I think the town was forever changed.